Chicago's Legendary Billy Goat Tavern May Be Displaced : The Two-Way A huge, expensive new development may temporarily displace the subterranean tavern, which has remained the same since 1964. John Belushi immortalized the place in a Saturday Night Live skit. 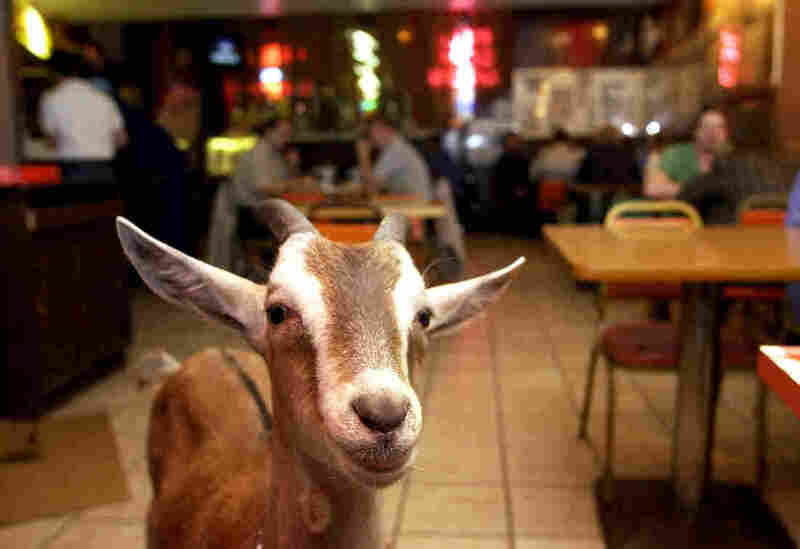 Billy Goat wanders around the Billy Goat Tavern in Chicago in 2003, when the Cubs lost the seven-game National League Championship Series. A huge, expensive new building planned for construction in Chicago may temporarily displace the legendary Billy Goat Tavern. The subterranean tavern has remained the same since it moved to that location in 1964. "Before 10 a.m. Tuesday, a few patrons were already sitting at the well-worn tables and chairs, waiting for their orders, admiring the photos that line the walls.
" 'Nothing has changed since 1964,' Sianis said. 'Nothing has changed from the time we opened up to now.' "
Nationally, the Billy Goat Tavern is famous for two things: It was immortalized by John Belushi on Saturday Night Live, and the original owner of the tavern, William "Billy Goat" Sianis — uncle of Sam — is the man who put a curse on the Chicago Cubs in 1945. Legend has it that the elder Sianis showed up to the Wrigley Field with his pet goat, which he said would bring the Cubs good luck in the 1945 World Series. His goat was denied entrance, because club owner P.K. Wrigley said the goat "stinks." Angry, Sianis left and said: "The Cubs ain't gonna win no more. The Cubs will never win a World Series so long as the goat is not allowed in Wrigley Field." Sixty-eight years later, the goat has not seen its baseball game and the Cubs haven't seen a pennant. But The Billy Goat Tavern is still standing ... although perhaps not for long.